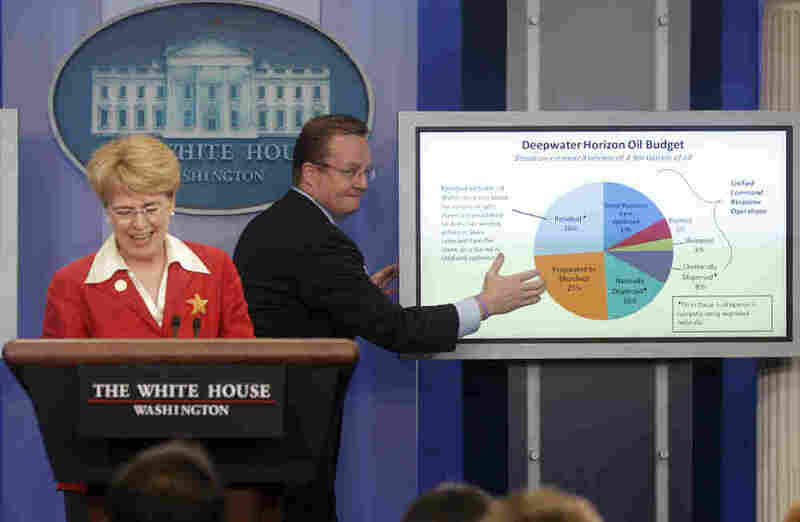 Obama Operative Didn't Create Vanishing-Oil Report: AP : The Two-Way An Obama operative didn't create the vanishing Gulf oil report, according to NOAA. His name was mistakenly included in the report as its creator due to a "technical glitch," AP reported. WASHINGTON (AP) - In a story Aug. 4, The Associated Press reported that a former campaign spokesman for President Barack Obama created a version of a science report that concluded much of the BP oil spilled in the Gulf of Mexico was gone. The National Oceanic and Atmospheric Administration said a technical glitch wrongly placed the name of the former campaign spokesman as creator of the NOAA science report and that he had no role in its creation. Wow -- who needs political enemies when you've got "technical glitches" like that conspiring to make your administration look cynical? For the record, the former campaign spokesman whose name, according to NOAA, was mistakenly included as creator of the report sent to Congress was Kevin Griffis, the Commerce Department's public affairs director who was an Obama campaign spokesperson in Virginia. Good thing that correction was necessary. Otherwise I would have missed that part of the story completely.